The results are in: Lizard Log Park & Playground in the Western Sydney Parklands is the BEST playground in NSW and the ACT! The Australian Institute of Landscape Architects awarded the designers of Lizard Log- McGregor Coxall and the Western Sydney Parklands Trust with the exciting title, and a free trip to Finland, home of the world’s leading playground manufacturer ‘Lappset’. It is referred to by locals as “Nature’s Wonderland” and is made, as far as possible, from natural materials in a bushland setting. Features include a massive sandpit filled with log formations for climbing, rope walls, rock scramble entry to the slides, water spouts, sand digging, a triple flying fox, basket swings and more. In the park, there are miles of paths for walking and scootering, natural features like mountains, lookouts and dams and a bathroom with an interesting water plant feature. There are about 20 picnic shelters and plenty of both coal and electric BBQ’s for an all day family visit. All the timber used is recycled, and the central playground structure is made out of trees that died onsite. This park is now a benchmark of sorts for environmentally friendly playground design. Check out some more Sydney playgrounds that were shortlisted in the 2016 competition. 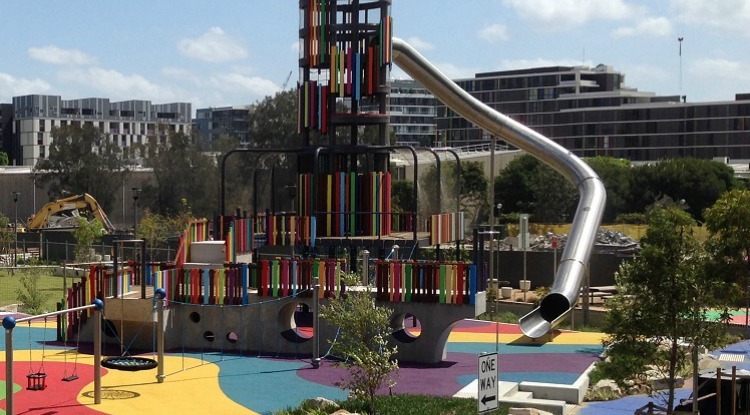 We were a step ahead when we voted Steel Park as one of the best FREE water play parks in Sydney. We checked out Wulaba recently when it was shiny and brand new! We visited Parramatta Park recently and we agree- it’s epic! We just love Darling Quarter and it’s water play- especially during the school holidays. The World’s Most Creative Playgrounds- Insane!